You can manually download the standalone libraries from the links above. Or use Minion to download them. You may need to close and restart the game to recognize the new libraries in the addon manager! If one of this depending library is missing you cannot enable the addon ingame! So please check the dependencies of the addon ingame. The best possible way is to install "Votans Addon List" addon which will seperate the addons from the libraries. It will show you the dependencies at each addon line, right column, as tooltip for the "red" icon (if an addon is disabled and cannot be enabled). Scroll down to the libraries at the bottom and enable the ones needed for the addon then. Comments / feedback / "Netiquette"
If you post comments about the addon not working anymore and haven't read and understood what is written here, it is not the addon's nor the developers fault! Just ask if you do not understand it, but tell me you have read this text! If not I won't answer or just write "Description" as a hint. Please keep in mind we do this on our free time and are not able to play this nice game if we need to work on the addons. If you show me you have read this text and ask in a kind way I'll help you for sure. Rude answeres/comments will force me to remove the addon totally from pulbic. This might make other ppl really angry with you and you can be sure I'll make your posts public so they can complain directly towards you. So please think before you ink and remember: This software is for free. We invest our free time for you. You got no rights to force me to do anything here Many thanks, I appreciate your help and understanding. This change is needed to reduce maintaining time of all the 30+ addons I need to keep updated. By removingg the libraries and let you install them as standalone "addon" I'm not forced to update the addons if the libraries change. This will save me hours of work! Please support me with this, install the libraries as standalone once via e.g. Minion and your addons will be set to work normally again + you gain the benefit to be able to update the libraries via Minion automatically as they are updated, and all addons will recognize it automatically without having you to need to wait for an update of each/or at least one addon containing the new library files. + the folder size of your AddOns folder decreases a lot if the libraries only need to be "ONCE" in the folder, and not also in each subfolder of the addons.! + I might use the gained time to work on fixing addons or adding new features as well. "Not included" in other addons zip files. You need to download the zip file of the "library" and install it alone, as if it would be a whole addon. You got the library then in your AddOns folder like AddOns\LibStub (like an addon is shown the same way, e.g. AddOns\FCOItemSaver). You need to close the game! If you install the standalone libraries with the game started they are not recognized properly. So close the game client or restart it before/after the standlaone libraries are installed. More time to play the game again and maybe maintain the addons better as I do not need to update each time if the library changes and can focus on the needed stuff. You will be automatically able to update the libraries as standalone versions via Minion e.g. and are also up2date all the time. Depending addons will recognize it automatically and need no addon update if simply the library needed an update. Libraries are code line which can be re-used in other code lines (addons e.g.). The LibAddonMenu-2.0 is for example a library which provides the standard UI and controls for the ingame settings so adodns are able to provide these settings (checkboxes, dropdown, texts, buttons) for you. Included libraries were only included into the addons to make life easier for you, the users, in the beginning of ESO. And there was a kind of bug which did not allow standalone libraries to be used properly, which got fixed meanwhile. The game assures via the library LibStub that libraries (included in other addons or standalone versions) will only load the newest version. So if a standalone library is loaded with the highest/newest version, the included libraries in other addons won't be loaded again. One could even strip them from the other addons as well to fullfill the purpose of a "library": Reusable code for several other code (addons). Unsorted loading of ALL folders which are inside the folder AddOns. It checks the folders if there are txt files in. It reads the txt files and check sif in there is specified if this folder is DependendOn or OptionallyDependendOn any other folder (addon, library). If dependencies are found it will load the dependencies first, and then the addon/library which depends on them. So as basically every library is depended on LibStub the game will load the folder LibStub (standalone library) first, or LibStub from any of the subfolders of an addon (included librray) if not found as standalone. The most important thing is the txt file (called: manifest) which gives the information about version, api version it was build for (will be compared ingame with the game's api version and if the version in the TXt is lower than ingame the addon/library will be "disabled" in the ingame addon manager until you enable the checkbox "Allow out of date addons"! ), dependencies of the addon/library. If you understand this, what libraries are, how they work, read the description of addons properly: You will have no trouble in the future. 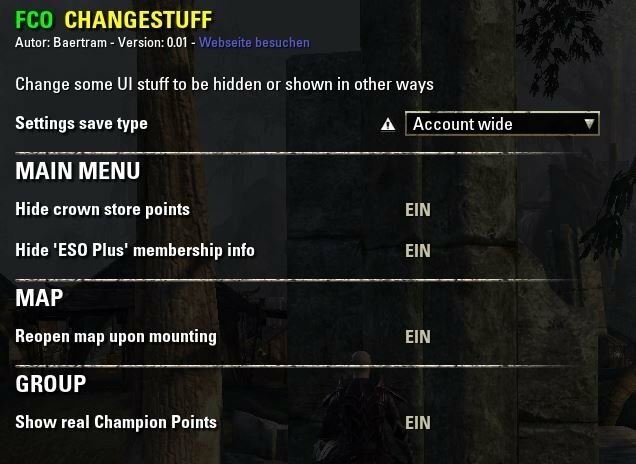 If you do not want to read, just press buttons to update/auto update everything without thinking, you do not want to understand/learn how eso addons work, but only use them: You might get in trouble in the future. But I bet there are other addons out there which fullfill your needs then (if they will not be changed to use standalone libraries as well, which might happen earlier then you think ). Simple tool to change a few UI related things. You need to enable each setting in the LAM settings menu (Press ESC key inagme and choose "Addon settings" from the menu), otherwise they'll stay at their default value: disabled! -Setting to block training of the mount (speed, stamina or carry). If two of the 3 are maxed out the settings are disabled automatically. -Setting to show an "switch between light/medium armor" button in the clothing create crafting tab. -Setting to blacklist some chat messages according to keywords that you are able to specify (e.g. specify the word "wtt" and you'll never see the chat messages containing "wtt" anymore. You're able to specify words, whole sentences or texts that should be searched for. You're also able to specify if the messages should be filtered in whispers, groups and/or guilds too. And you are able to actvate a setting to show who has posted a blocked text, containing a timestamp and the whole message + your specified keyword that was found in the message to analyze messages and build better keywords. -Setting to mark skill lines as "not relevant"/"relevant again"
You are able to mark a skill line as "not relevant"/"relevant again". The entry will be grayed out and gets the status icon set to a red X if it's marked as not relevant. Right click the skill line to show the context menu. -Setting to hide the crown store advertisements upon login. Manually calling the advertisements from the mainmenu will work. Settings can be saved account wide (default value) or for each character. Simple and just for my needs. Maybe it helps someone else. Please download them as standalone! versions and close the game client before/afterwards, restart the game. Check the description of this addon for further details please. -Added option: Show warnign on screen if you write a whsiper message but your current status is "offline". Press "O" to change your status then in order to get incoming whisper messages. If you are offline noone will be able to write you whisper messages! -Added option (on request): Keybind to toggle the settings for "quest givers on compass". Fixed: Player pin on map "PingPong effect" works without enabling setting "Remount on map open"
->Works on "Votans Minimap" too. Removed libraries and fixed stuff. Fixed: After enabling the "Hide crown advertisements popuP" settings the next login disabled the game main menu. -Added option: Show "Enable/disable all filter" at the worldmap filters. Should work with Summerset update. Added option to enable a context menu at the skill type headers. You are able to mark a skill line as "not relevant"/"relevant again". The entry will be grayed out and gets the status icon set to a red X if it's marked as not relevant. ReAdded the chat blacklist and hopefully fixed the client crashs that happend after a zone change/wayshrine travel. Had to remove chat blacklist as it seems to freeze the client somehow. It might depend on other addons but as long as this happens I have to remove the functionality again and test where the freezes come from. Added: A button was added at the clothing crafting station to switch directly to the medium/light armor parts. If you click the button the list will autoscroll to the same item type that you have currentl selected (e.g. light head->medium head). You can click the button with the SHIFT key pressed to directly select the start of light/medium armor (the chests). Fixed slash command for "Leave group" -> Thx to manavortex! You need to set the settings new as I needed to change some major way of saving them, sorry. Fixed: Stable settings are now not blockable if you already trained the speed, carry, stamina settings to the max and all stable settings are disabled if 2 of them are already maxed out. Updated the map scene for the gamepad mode so the map should be reopened again too, if the map was opened upon mounting in gamepad mode. -> In gamepad mode: If you are not able to mount during the map is opened this addon won't and cannot change this restriction! Is TewakIt not working anymore? I always wanted the hero doll at the other stations too but I could not find time to implement it again. Maybe in the future. Try out PerfectPixle. I think it provides a keybind to compare your item below the cursor (at inventory, and banks) with the currently equipped items. Both tooltips will be shown then. This helps for the moment. (Optional Setting) Hero Doll -- Displays the Hero Doll (UI with current gear on the hero) while at the bank, and while at merchants, (NEW, now also displayed at) guild bank, guild store. Last edited by Marazota : 03/10/19 at 03:12 PM. Last edited by Marazota : 02/25/19 at 11:39 AM. Are you using version 0.1.79? I'm not getting this error with this version. The uploaded file is wrong. Will re-upload it. Last edited by Baertram : 02/25/19 at 11:34 AM. There is a tiny bug in this addon. The Visit Website link points to your FCOLockpicker website. Added: Feature to turn down (slider to choose between 0-100%) the volume of the game if you approach a crafting station. Volume will return to your volume level before as you leave the crafting station. Sorry, not really interested in this. Only 10, one can remember them easily I'd say. Good for the brain. Last edited by Marazota : 09/13/18 at 06:10 AM. Google, took me 1 minute to find. Last edited by Baertram : 07/05/18 at 11:37 PM. New beta including option to move the battleground HUD by the help of the mouse (saving it's position).